Joan Pearson in the projection box at the A.B.C. Aston cinema, Birmingham. By the 1960s, the view that women projectionists were less competent than men was being challanged by those doing the work. Prejudices still remained, particualrly among the male projection staff, but management in general seemed more amenable to the prospect of agreeng that women could be senior projectionists. 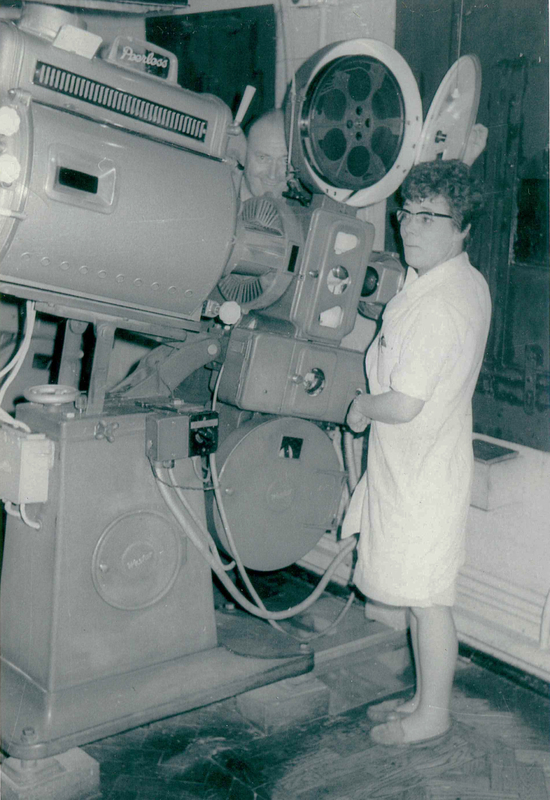 Joan Pearson continued in the box as a projectionist until the mid-1970s when she changed careers following the closure of the cineam she was working in. It is perhaps Perhaps because of Florence Barton's high standards as Chief projectionist that she was given the first automated projector in Coventry - a 'Projectomatic - to operate. However, because Barton's expereinces with her male colleagues had been so poor, her memory of why she got the Projectomatic was somewhat different as the audio extract below makes clear. Although there was an increasing number of women projectionists working in projection boxes in the UK, it was still relatively uncommon. Below is an extract from a 1966 episode of Mining Review which details the working life of 'Dorothy' a miner's wife from Bishop Aukland, County Durham. The novelty factor of the item seems to come from the fact that 'for a woman, Dorothy has a rather unusual job', and this is especially the case given that she has a position of superiority. The lack of visibility of women in the projection box is highlighted by the narrator's comments that Dorothy is 'probably the only woman chief projectionist in the business', a statement that is proved untrue by Florence Barton's story. Florence Barton gets the first automated projector in Coventry. By the end of the 1960s, many cinemas in the UK were moving to single-manning processes. This meant that projectionists would tend to work alone during their shift with the help of automated projectors and long-playing film reels (see the Changing Technology; Changing Work exhibit for more details). Because of this it was less common for women projectionists to encounter the kind of hostility that had taken place previously because they were dealing with fewer male colleagues on a day-to-day basis. The shift to the multiplex model of cinema exhiition also meant that the projection box became a more accessible place, and whilst it remained the case that most cinema projectionists were men until the arrival of digital projection there were a greater number of women working in projection boxes during this time. A segment from a 1966 episode of the magazine film Mining Review telling the story of 'Dorothy', a woman projectionist from Bishop Aukland.